Why I am going to have a child that won't look like me. When I read this in a online forum when I was expecting Tommy, it hurt me so much because I already loved my baby. I knew for sure he won't look like a monster, regardless the facial features he could get. Flattened nose. Tommy's flattened nose bridge is not exclusive from Trisomy 21. His flattened nose bridge is a heritage from my mom's genes. Tongue trust. Tommy's tongue trust is not exclusive from Trisomy 21. My sister has tongue trust, but it didn't affected her as is affecting Tommy. Small ears. Tommy's small ear are not exclusive from Trisomy 21. I do have small ears, too. Slanting eyes. Tommy's slanting eyes are not exclusive from Trisomy 21. I also have slanting eyes. I have even heard comments that Tommy's eyes are just like mine. Epicanthal fold (The inner corner of the eyes may have a rounded fold of skin). Tommy doesn't have Epicanthal fold, but my typical son does. The hands may have short fingers. Tommy's short fingers are not exclusive from Trisomy 21. Tommy's daddy also have short fingers. My sister in law have commented several times how Tommy's hands look just like my husband's. Single palmar crease. Tommy's singles palmar crease is not exclusive from Trisomy 21. Ironically, my husband and I have a single crease. Mine is in my right hand and my husband's is in his left hand. Tommy's single crease is in his right hand like mine. Bigger gap between the big toe and second toe. Tommy's bigger gap between his toes is not exclusive from Trisomy 21. My sister does have a bigger gap between the big toe and second toe in both feet. 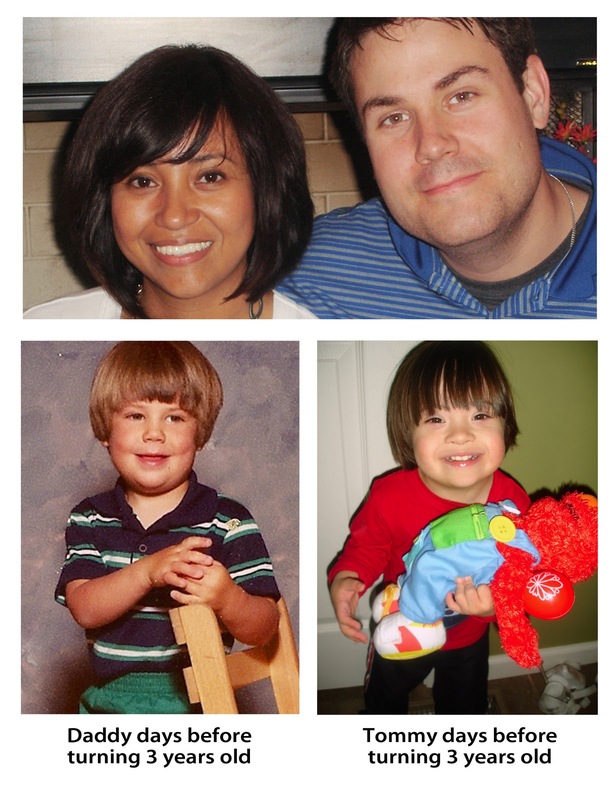 Ironically, my son who has trisomy 21 does look like my husband and I. But we are still figuring out whom our typical child looks like. He does look Hispanic, but it is hard to tell specifically whom he looks like. So now, I have an answer for the person who wrote in that forum: Not because my son, Francis, doesn't look like us we don't love him. We know all cells of his body have our genes. As far as he grows, we will know how much he will look like mommy and daddy because of his personality, behaviors, preferences, and them some. I don't think it will be different if Tommy wouldn't look like us because of the facial features link to Trisomy 21.
before turning 3, what a coincidence!